Hungarian free city and Adriatic seaport, with a Jewish population in 1901 of about 2,000. That there were Jews at Fiume in the eighteenth century is indicated by the existence there of a Jewish tombstone dated 1746 and a scroll of the Law dated 1789. They were mostly Sephardim who had emigrated from Dalmatia and the Levant, especially from Ragusa and Spalato. Down to 1835 their minhag was that used at Spalato, and their prayer-book was that of David Pardo, rabbi at Spalato. 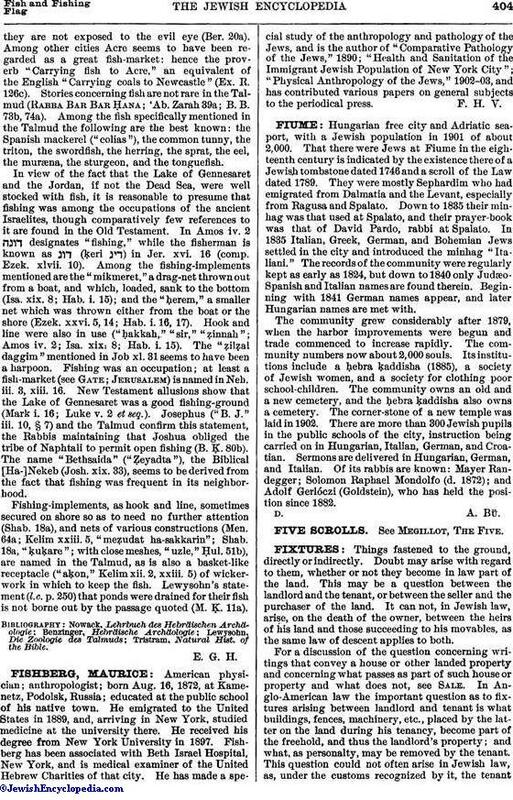 In 1835 Italian, Greek, German, and Bohemian Jews settled in the city and introduced the minhag "Italiani." The records of the community were regularly kept as early as 1824, but down to 1840 only Judæo-Spanish and Italian names are found therein. Beginning with 1841 German names appear, and later Hungarian names are met with. The community grew considerably after 1879, when the harbor improvements were begun and trade commenced to increase rapidly. The community numbers now about 2,000 souls. Its institutions include a ḥebra ḳaddisha (1885), a society of Jewish women, and a society for clothing poor school-children. The community owns an old and a new cemetery, and the ḥebra ḳaddisha also owns a cemetery. The corner-stone of a new temple was laid in 1902. There are more than 300 Jewish pupils in the public schools of the city, instruction being carried on in Hungarian, Italian, German, and Croatian. Sermons are delivered in Hungarian, German, and Italian. Of its rabbis are known: Mayer Randegger; Solomon Raphael Mondolfo (d. 1872); and Adolf Gerlóczi (Goldstein), who has held the position since 1882.